Modernist Jewelry - This is an original sculptural sterling silver ring beautifully handcrafted featuring an oval Black Onyx cabochon. Shanks are adjustable for easy sizing, but can come soldered if preferred. 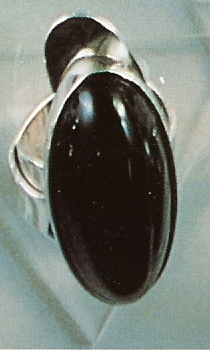 Handcrafted Sterling Silver ring with a black onyz stone. This ring is available with other stones and is custom made. It is a beauty and is signed by Aaron. Allow extra half size for wide shank.